In Part II of this article, it was argued that many of Uganda's energy needs can either be eliminated or fulfilled without having to use electricity. In Part III we appreciate that, as a state existing in modern times, Uganda cannot escape from the need to produce electricity. While agreeing that electricity must be produced for some purposes, this article will later propose an alternative model for its generation. The model that is existing and the one that Uganda's planners aim to perpetuate is centralised electricity production. 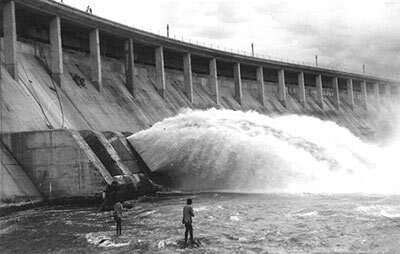 Thus we have the Owen Falls Dam (and its extension) as the premier producer of energy for the entire Uganda. At the same time, other large dams are proposed at Bujagali and Karuma. In this centralised model, power from a few generation centres is distributed to various parts of the country. This article argues that centralised electricity production leads to significant problems. The obvious one is that centralised production will incur costs in distribution of the electricity all over the country (in terms of investment in infrastructure, running costs and losses due to long distances). Such costs ultimately make it impossible to get electricity to all Ugandans (this is a major reason why only 12 percent of Ugandans have access to the electricity grid). The Owen Falls Dam. This centralised model for electricity generation creates several problems for Uganda (Picture sourced from the internet). But, and perhaps more significantly, centralised production is intrinsically large-scale and therefore requires huge initial resource investment (such as sophisticated machinery and certain technical skills). It so happens that these resources are unavailable in the country. Hence they must be imported, and for our impoverished economy, with borrowed monies. The centralised model is an expensive choice that is unaffordable by the banana republic that Uganda is. For example, the last time I checked, the Bujagali dam was projected to cost 700 million USD or almost 1300 billion UGX. This is more than one third of the entire national budget and 6 times more than all the funds budgeted for energy in financial year (FY) 2005/06. Given such colossal sums, Uganda has no option but to borrow the monies. With just a single project, Uganda's debt increases in a gigantic leap. A corollary argument is that by depending on equipment, skills, and financial resources that are not locally available, Ugandans mortgage their power to make decisions on electricity: e.g. when to have it, where to have, how to cost it for the consumer etc. For example, the funders of the Bujagali project have managed to stall it for over five years. The same is illustrated in the case of diesel (which is mainly used for electricity production) whereby, because of decisions by Kenyans, Uganda suffered a scarcity of the crucial raw-material in April 2007. Another factor worth considering is that huge centralised production leads to huger risks of failure and loss. A classic example is the Owen Falls "extension" project that, after swallowing colossal sums of money, ironically reduced power generation capacity from 230MW to 135MW!! Apart from the above mentioned problems with centralised electricity generation, further problems arise due to centralisation of the industries and households that use the electricity. The later centralisation happens because it is cheaper to either use the electricity at the locality of production or to transport it to a few centres as opposed to the entire country. Thus, in the centralised model, all job-generating factories and businesses get to be concentrated in a few towns leaving the vast countryside with insignificant economic activity. For instance, Kampala with less than 10 percent of Uganda's population has a lion's share of businesses in Uganda. Similarly, only a few households that are fortunate enough be located in or near the urban centres can get connected to the electricity. With centralisation of electricity generation, businesses and electricity-consuming households, the phenomenon of rural-urban migration is set in motion. This phenomenon, where people leave villages to search for jobs, and shiny lights in the city, ultimately enervates the villages while overcrowding the towns. In the fourth and final part of this article, the advantages inherent in a decentralised electricity generation model for Uganda's context will be discussed. He undertook his doctorate studies at the Oslo School of Architecture. His doctorate research proposal was entitled "Living in Earth the Sustainability of Earth Architecture in Uganda".